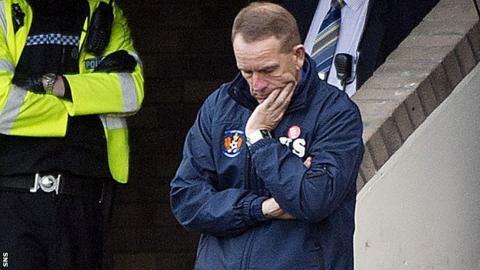 Kilmarnock manager Kenny Shiels described his side's defeat by St Johnstone at McDiarmid Park as "one of those days". "I think the score was just about right," he told BBC Scotland after losing 2-1 in Perth. "We take our defeat on the chin and we'll bounce back. We've lost two in a row now, which is not a crisis but it's something we're prepared to correct. "The direct play helped them a lot and it was more successful on the day." Shiels was keen to stress how well Saints had performed, with the Perth side racking up a fifth straight league win. "Fair play to St Johnstone, they've a really good agression about them and an energy of positivity and that helps so much," said Shiels. "We've got to get ourselves back to where we were playing. It's just one little tweak here and there and, who knows? We can do that. "I'm not saying they worked harder than us because both teams worked hard and they haven't got more quality. "When you're winning, things go in." Killie almost levelled when they were 1-0 down, Cillian Sheridan's free-kick hitting the post. James Fowler did find the net late on after Saints' second. "I don't know how it stayed out," Shiels said of the Sheridan set piece. "Certainly it was unlucky but I don't think we were unlucky today. We have to give St Johnstone some credit. "It's not just about us losing, we have to look at how they won the match."